(AFP) - Japan is considering pulling out of the International Whaling Commission (IWC), officials told AFP on Thursday, as Tokyo reportedly gears up to resume commercial whaling activity next year. Such a move would spark international criticism against Japan over whale conservation and deepen the divide between anti- and pro-whaling countries. 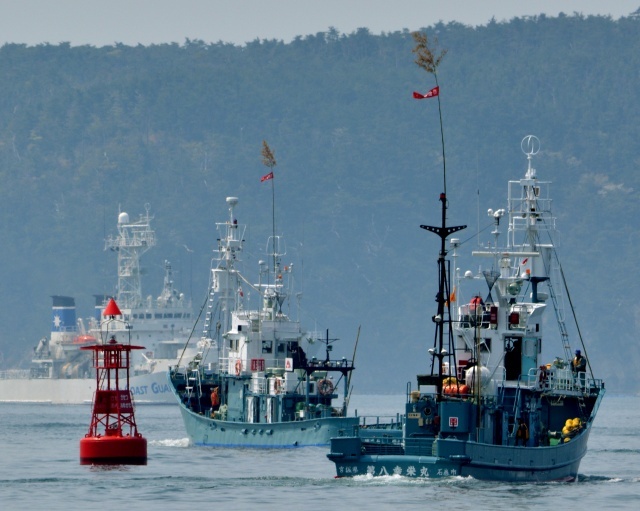 "We are considering all options" including the possibility of withdrawal from the 89-member IWC, Fisheries Agency official Yuki Morita told AFP. Another official at the foreign ministry confirmed "all options are on the table but nothing formal has been decided yet". Both stressed Tokyo has not yet changed its whaling policy but Japan threatened to pull out of the IWC in September when the commission rejected its bid to return to commercial whaling. Citing unnamed government sources, local news agency Kyodo said a formal decision to withdraw from the IWC would come by the end of the year. After a tense September vote in Brazil, the IWC rejected Japan's bid to return to commercial whaling, prompting vice-minister for fisheries Masaaki Taniai to say Tokyo would be "pressed to undertake a fundamental reassessment of its position as a member of the IWC". Anti-whaling nations -- led by Australia, the European Union and the United States -- defeated Japan's "Way Forward" proposal in a 41-to-27 vote. Following the ballot, Japan's IWC commissioner Joji Morishita said differences with anti-whaling nations were "very clear" and Japan would now plan its "next steps". The IWC was established in 1946 to conserve and manage the world's whale and cetacean population. It introduced a moratorium on commercial whaling in 1986 after some species had been fished to near extinction. Japan insists whale stocks have now recovered sufficiently to allow commercial hunting to resume. Tokyo currently observes the moratorium but exploits a loophole to kill hundreds of whales every year for "scientific purposes" as well as to sell the meat. Iceland, along with Norway, openly defies the IWC's 1986 ban on commercial whale hunting.